My general educational background had been pretty much standard except for the fact that I was one of the first of a group of Harlem children bussed from P.S. 197. We were bused to P.S. 7 in the Bronx’s, Kingsbridge for an improved and more advanced education. The kids in the Kingsbridge section of the Bronx were predominantly white and had a more educationally developed curriculum. Because some of the white kids called us Niggers many of us tykes from Harlem refused to admit our educational inadequacies and deficiencies so we faked it. I pretended that I was more advanced in English proficiency once I arrived. All through the rest of my life and was able to get by with just a minimum amount of English adeptness. I wanted to be a writer when I grew up so I wrote a script and left it with Robert Redford’s doorman. Redford wrote me back with encouraging statements, “Its good stuff.” I then went on to write a second movie script and it became a finalist in the 1991 Writer’s Guild of America East Contest. I studied with the National Academy of Television Arts & Sciences and in activist/actor Ossie Davis’ Institute of New Cinema Artists program in 1977. In the spirit of James Baldwin’s The Fire Next Time, Grant Harper Reid’s Harlem Bible: In the Beginning is a memorable offering that helps readers rediscover the soul and spirit of black culture in Harlem. In this spellbinding autobiography, the author relives wonderful and touching memories of his childhood, growing up as a black man in Harlem. The author explores the dreams of black families, poised for the revolution — perhaps gentle like the wind — that was a promise of an upward movement in the American economic status. Readers are introduced to the shift in culture, thanks to the advent of gentrified folk. But what was Harlem like among the black community? This book answers that question and offers more. 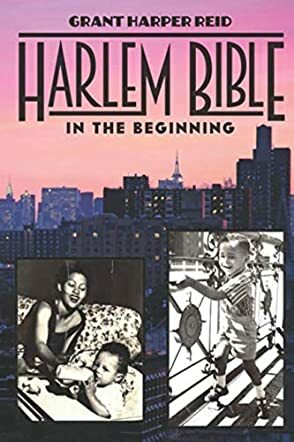 Harlem Bible: In the Beginning is a wonderful book, a well-crafted memoir that explores the dynamics of black culture in Harlem and redefines the very soul and spirit of the “black man” within a well-defined historical context. The writing is beautiful, laced with arresting images and, I must say, Grant Harper Reid has a phraseology that gives a unique signature to his writings. The language is fluid and laced with humor and symbolism. For instance, just few lines into the narrative, he describes his usual visits, accompanied by his dad, to the house of one wealthy man: “Whenever my dad and I went to visit Mr. Llewellyn, he'd be either wearing a smoking jacket or a bathrobe on his balcony deck. If that wasn't dressing for success, I don't know what is.” The reader finds themselves smiling quite often as they read through the gripping and enjoyable narrative, the cultural and social commentaries opening a whole new world for the reader to navigate.